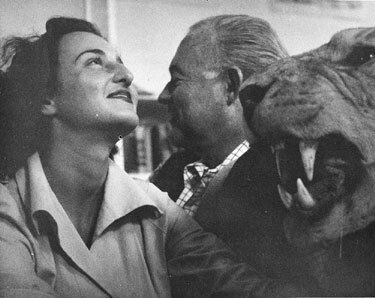 Adriana Ivancich, Hemingway, and friend in Finca Vigia, Cuba. The life of Ernest Hemingway remains sufficiently fascinating that a new book has appeared, Andrea Di Robilant’s Autumn in Venice: Ernest Hemingway and His Last Muse, chronicling the great man’s not-necessarily-ever-consummated infatuation at age 49 with an 18-year-old Italian countess. That inappropriate relationship, ironically enough, provided the gravamen of Ernest Hemingway’s worst, only genuinely bad, downright embarrassing novel, Across the River and into the Trees. Rafia Zakaria, a columnist for Pakistan’s largest newspaper (! ), reviews the story of Hemingway’s Last Girl with chilly feminist scorn for the dirty old man’s incestuous infatuation with a younger woman he called “daughter,” and wrathfully concludes with a stern determination to call literary geniuses to account for their “sins” and their “misogyny” on behalf of the “maligned women” in their lives. Take that, Papa, you beast! Autumn in Venice… is a chronicle of sorts of this last affair. Hemingway, then very much married to Mary Welsh Hemingway, who had ostensibly “stolen” him away from Martha Gellhorn, romanced Adriana right under his wife’s nose. The story of Adriana and Hemingway was initially interposed between Mary Hemingway’s “major shopping sprees”, “hours of sightseeing” and yet more shopping trips. It ended with Adriana and almost her entire family installed in the Hemingway’s home, fixtures at the caviar laden, booze filled evenings that oiled Hemingway’s daily grind. In subject and content, the affair with Adriana, and indeed with Venice itself, was rather predictable and even banal. Hemingway had always craved the euphoria of being in love and had chased it all his life without concern for the cost it imposed on existing relationships and, as it were, his wives.